Shipping a container is a daunting undertaking if you have not done it before. But fret not, we’re here to get you on the right track! When you are shipping a container there are a series of questions to help you ask yourself to get pointed in the right direction. 1) Do you want to do all of this on your own? If you’re reading this, probably not. And unless you ship often, you probably don’t know all the ins and outs of shipping containers. We recommend working with a freight forwarder who can walk you through all the steps in shipping a container so it goes smoothly. You can also work directly with some shipping lines. But remember, not all shipping lines go to everywhere. You may need to do more legwork to find the right shipping line for your destination. From this point on, we will assume you’re working with a freight forwarder. 2) Do you want to own a container when your goods get to their destination? If you just want to get your items from point A to point B, probably not. But perhaps when your items get to the destination, you want to use the container there, then you may want to own your own container. Shipping lines will provide a container for you to use if you just need transportation. Otherwise, you can buy a container so you don’t have to give it back when it gets to your destination. Talk to your freight forwarder about your decision as it will affect your shipping rate. If you are using the shipping line’s container, move to the next question. If you want to own your container, this is an easy process. You will need a cargo-worthy container. Which means it is one that is structurally sound enough to be put in the bottom of the ship and have other containers stacked on top of it. Also, you will need a certificate showing your container is cargo-worthy. In some cases, you will need to change the number on your container which shows that it no longer belongs to the shipping line that was using it before you. Your friendly container vendor (Super Cubes!) can help you with this. 3) What size container do you need? 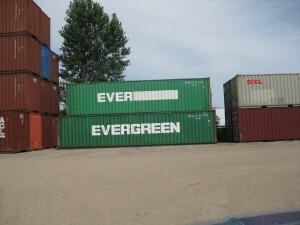 Standard shipping sizes are 20’, 40’, and 40’ high cube containers. For full specs, see our previous post on them. 4) How are you going to load your container? This is usually the biggest concern for most people shipping containers. Ideally, you’d get to have your container set on the ground for you to load at your leisure over days, weeks or months. However, there are some logistical challenges to that scenario. If you want to load your container on the ground, then be prepared to be able to pick your container up to set it on the truck. The trucks that bring containers into rail yards and ports are not equipped to pick up containers. And even trucks that can pick up containers cannot pick up full 40’ containers since they are too heavy. If a crane is not practical (tip – it rarely is), then you will need to be ready to load the container as it sits on the chassis (container trailer) that will bring it to the rail or port. They are dock height, so if you are loading from a warehouse with a dock – perfect! If not, you will need to get a ramp to load your container. Timing. Most people want to have plenty of time for loading. However, most trucking companies that move containers provide 2 hours of loading time in their standard quotes. If this will not be enough time, work with your freight forwarder to arrange for more time, but be prepared that you won’t have weeks or months to load, so you may want to arrange to collect everything before the container is delivered. You may have to have movers there to quickly load the container. If you are loading vehicles into your container, make sure you tell your freight forwarder, as there are strict guidelines in how to properly secure vehicles. 5) How do you get your container to the port? Your freight forwarder will also help with this. If you are near a port, they will arrange to have your container brought to you, you load it and then it goes to the port. If you are further inland, they will arrange to bring the container to you, you load it and then the container goes to a rail yard where the container is sent by rail to the port. Your freight forwarder will also help you with transportation in your destination country. It is important to find a freight forwarder you feel good about. They will be helping you with customs forms and dealing with the shipping line. It is critical that you are open with them about what you are doing with your shipment as there are complex rules about how to ship various items.